Post for missing tablet. 24th Kentucky Infantry tablet (297) visible in background. First position in line of battle April 6, 1862,was at this point on regimental color line. Location. Marker has been reported missing. 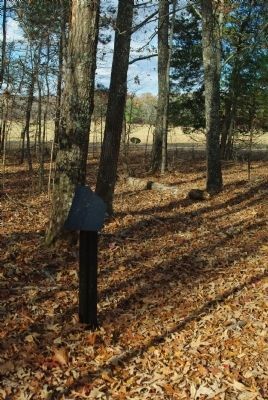 It was located near 35° 7.981′ N, 88° 20.75′ W. Marker was near Shiloh, Tennessee, in Hardin County. Marker could be reached from Hamburg-Purdy Road half a mile east of Sherman Road, on the right when traveling east. Touch for map. 60 yards southwest of road behind 49th Illinois tablet at roadside, in Shiloh National Military Park. Only the post remains. Marker was in this post office area: Shiloh TN 38376, United States of America. Touch for directions. Other nearby markers. At least 8 other markers are within walking distance of this location. 49th Illinois Infantry (within shouting distance of this marker); 24th Kentucky Infantry (within shouting distance of this marker); 40th Indiana Infantry (within shouting distance of this marker); 57th Indiana Infantry (about 400 feet away, measured in a direct line); 15th Indiana Infantry (about 400 feet away); Veatch's Brigade (about 600 feet away); a different marker also named 49th Illinois Infantry (about 700 feet away); Camp of 43rd Illinois Infantry (about 700 feet away). Touch for a list and map of all markers in Shiloh. More. Search the internet for Camp of 49th Illinois Infantry. Credits. This page was last revised on June 16, 2016. This page originally submitted on December 14, 2010, by Allen Gathman of Pocahontas, Missouri. This page has been viewed 427 times since then and 8 times this year. Photo 1. submitted on December 14, 2010, by Allen Gathman of Pocahontas, Missouri. • Craig Swain was the editor who published this page.